Erin Lally is Acadian’s Paramedic of the Year for Texas operations. 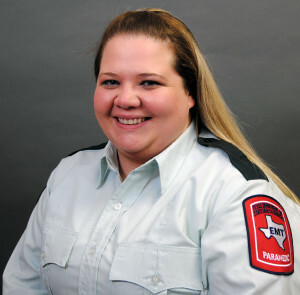 Erin joined Acadian in 2008 and became a Paramedic in 2011. Also a Critical Care Paramedic, Erin provides a higher level of care and increases safety for critically ill and injured patients being transported from hospital to hospital. She also maintains an outstanding HSE performance record, creating a more positive work environment. While she is an active volunteer for the Bridge City Fire Department, her long-term goal is to become a Flight Paramedic. In addition to being an outstanding clinician, Erin is a strong advocate for customer service.